interdependence of all forms of life. children and other children. 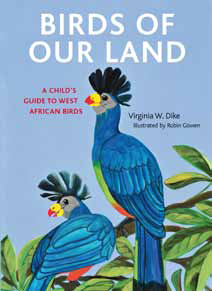 But she couldn’t find books on Nigerian or West African birds. Instead, the bookshops had plenty of books about birds from the United States and Britain. things in the natural environment. them an appreciation of the beauty and interdependence of all forms of life. founding member of The Children Centre Library at the University of Nigeria in Nsukka. Though not an environmentalist, Dike has had a lifelong passion for nature. that what is available – to some extent – are textbooks. them. Others books in the series will focus on trees, flowers, the seasons and many more. what is a growing pool of high-quality local literature. with the author, contact: info@cassavarepublic.biz or call: 0818 580 2634.